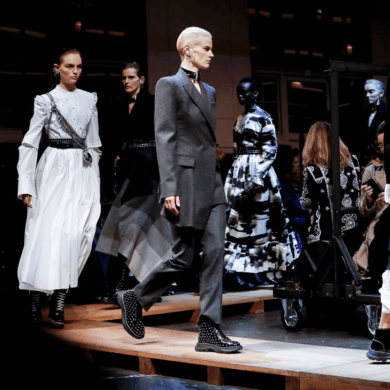 The annual Met Gala is often referred to as “fashion’s biggest night out,” and it’s an opportunity for fashionistas around the world to revel in the avant-garde creations that appear on the red carpet. 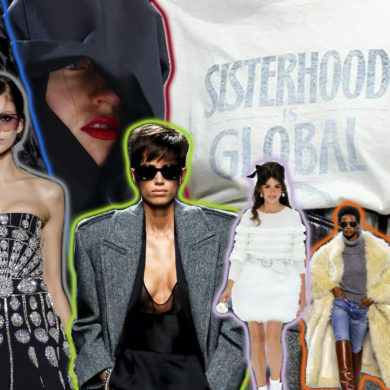 This year, “worshipping fashion” took on a literal meaning, with the controversial yet Vatican-approved theme of Heavenly Bodies: Fashion and the Catholic Imagination. The Metropolitan Museum of Art’s Costume Institute exhibit, which explores Roman Catholicism’s influence on fashion, features more than 150 designer pieces as well as 50 garments and accessories loaned from the Vatican. But at the opening gala, all eyes were on the unique looks worn by celebrities, industry professionals and creatives, who all looked — some literally — quite heavenly. This year’s co-host dressed like the queen that she is, wearing a white Pope-inspired Margiela creation. She paired the pearl- and crystal-embellished corset mini dress with a matching jacket, voluminous skirt, and beaded bishop’s hat. The headpiece was reminiscent of the papal tiaras worn by popes until the mid-1960s, and she chose a bejeweled crucifix necklace to match. 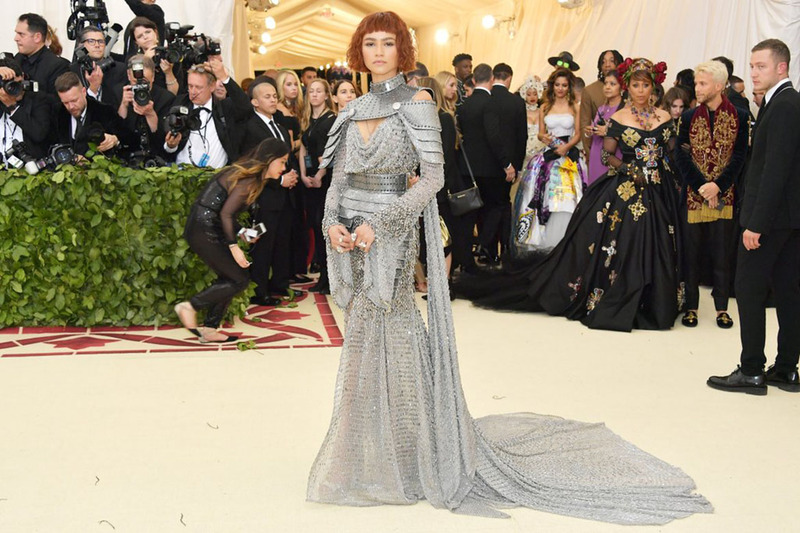 Zendaya chose to channel one of Catholicism’s most powerful women: Joan of Arc. Her custom-made silver Versace gown resembled a suit of armor with its metallic neck-and-shoulder piece, spiked belt and chainmail fabric that teetered off into a long train. The model’s Moschino dress was a literal interpretation of this year’s theme: a column dress decorated with religious icons and entirely encrusted with jewels. The 23-year-old model donned an embellished asymmetrical Versace dress that resembled both the wings of a butterfly and the stained glass windows of a cathedral. With its intricate beadwork, thigh-high slit and long blue train, the gown is a work of art — and not just because it looks painted onto her body. The actor, comedian, and rapper, who also goes by his stage name “Childish Gambino,” wore a ’70s-inspired Gucci suit that, from the front, appeared to be a basic pale purple suit. When he turned around, he revealed a gold-encrusted “Eye of Providence” embroidered on the back, which symbolizes the all-seeing eye of God (and is a nod to the conspiracy aspect of Christianity). He eschewed traditional black shoes for white Gucci loafers. 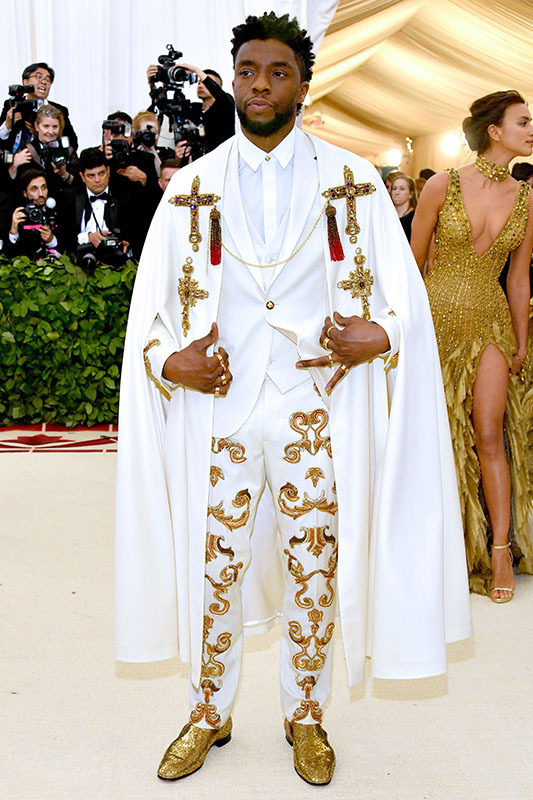 The king of Wakanda was the king of the red carpet by pairing gold Louboutin loafers with a white Versace suit and cape adorned with gold-encrusted crucifixes and other religious symbols. A print of Michaelangelo’s iconic 16th Century painting of the Last Judgment, which covers the back altar of the Sistine Chapel, served at the fabric for the pop star’s Vera Wang gown, making her a walking work of art. Only Lily Collins in Givenchy haute couture could make dressing like a nun look edgy and glamorous, including an asymmetrical top paired with a sheer black skirt. Her makeup was just as dramatic as her dress, with gems placed under her eyes and a blood red teardrop painted onto her cheek. Her hair was slicked back into a tight bun, framed with elaborate braids and a spiked metal headdress. As the final celebrity to walk the red carpet, Blake Lively certainly lived up to the adage “save the best for last” in a show-stopping custom-made Versace gown that took more than 600 hours to make. The crimson gown featured intricate embroidery, a gold-encrusted bodice and a dramatic train that was so long that she had to arrive at the gala in a party bus.